How to search for Carpenter Ants? 1 How to search for Carpenter Ants? 2 How to get rid of Carpenter ants? 3 How to prevent Carpenter Ants from coming back? Carpenter ants, also known as the Sugar ants, are primitive to many forested places in the world, except in Antarctica where freezing temperature is inhabitable for them. These ants can grow from 0.3 to 1.0 inches or 0.76 to 2.65 cm. The most known species of Carpenter ant that lives with human habitation is the Black carpenter ant, with the scientific name Camponotus pennsylvanicus. Carpenter ants may settle their nest in indoors or outdoors. A suitable nesting spot outdoors for Carpenter ants are often established under fallen hardwood trees, than they may contain in access holes and other cracks/crevices. Carpenter ant colonies do require a consistent humidity and temperature; these ants often look for rotten trees that have moisture in them. They are also known as the Sugar ant, they love to establish colonies in fruit bearing tress that provide them a moist shelter as well as food for the Queen and Larvae. Carpenter ants have been known to establish underground tunnel structures within these trees. The complex tunnel structures can contain typical colonies that have a “parent” colony; with a laying queen, handful of workers and numerous broods surrounded and supplied by smaller satellite colonies, that contains a mature larvae and pupae. The gradual growth in human population and the numerous ways of known deforesting to establish new human communities paves the way to have these natural habitats for Carpenter ants to live with us. Most of these Carpenter ants enter homes in search for water and food. It is important to find out where the ant colonies are staying as early as possible, to prevent these ants to cause serious damage. Carpenter ants may create nest in or around wall infrastructures, may it be wood or even hard concrete. These Carpenter ants that live in walls, loves to chomp on lumber and sawdust, using the sawdust byproducts to help them build new nests. They can be even unforgiving to chew upon wall insulation and wall braces, which can lead to weakening of the walls. Moist rugs or even wet towels also provide a cool place for nesting for these ants. Make it a habit to always check below rugs or doormats. The kitchen place is also a good spot where these ants want to settle their nest. The bottom of the sink provides a cooling spot for nesting and water; while uneaten and spoiled foods will be in their reach. The first thing you should do is to confirm if you are really dealing with the carpenter ant and not a termite. 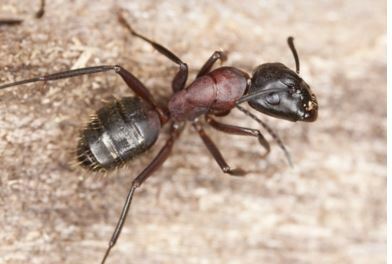 Carpenter ants are dark brown insect with three body segment, six legs. The Termite, have light colored bodies and straight antennae, are far worse problems. Find frass droppings. Frass, is a sawdust like material byproduct when ants bore into woods to penetrate wooden walls or floors. If seen around your house, it’s a sign that Carpenter ants passed through your walls. An access through these walls might be impossible so an aerosol spray insecticide must be used. Aerosol sprays can seep in tiny holes. You can use these ant spray insecticide on walls, doors and even windows. Do take necessary precaution while using pesticide; it is poisonous. It’s a good practice to use gloves and mask while using this product. To locate the nest, you have to lure the ants out. A good method is a Trojan horse strategy. Slow acting toxic bait is placed along the ant trails and ant workers will carry it back to their colony. The slow acting toxic will kick in after distribution and killing all ants that feed on it. This might take awhile, but will surely control the ant population. Another baiting method would be to locate the ant nest and prepare a simple mixture of a spoonful of sugar (ants love it) and spoonful of milk (in some point of the ants life cycle they also need to take in protein). When the ants are lured out, spray vast amount of insecticide spray directly and track some of them back to the nest. It is the best method when you have an easy direct access to the ant’s nest. You will have to pour large amount of dusting product over the colony; with great chances of killing their queen ants. Boric acid can be bought at any garden supply store. Mix a ratio of 2/3 of boric acid with 1/3 powdered sugar in a cup. Boric acid will penetrate the nimble ant’s body and dissolved inside the ant killing it directly. How to prevent Carpenter Ants from coming back? A clean home prevents bad breeding and nesting place for these ants. Regular cleaning will contribute a lot. You can buy silicone sealant at any hardware or store. Apply a good amount to your foundation walls that has holes, crack doors and windows. Remove dead trees and trim bushes. Dead trees and shaded bushes are good nesting places that provide them a cool place to nest.